Associate professor in Animal Physiology. Associate professor in Animal Physiology and Internal Tutor of ESR12: Valorisation of alternative, healthier and environmental compatible food production chain relying on typical sheep breeds in Abruzzo Region. November 2000 - Present: Associate Professor in Animal Physiology, University of Teramo (Italy). 1995-October 2000 Research scientist, Institute for Zootechnics, Olmedo, Sassari, Italy. 1992-1994 Post Doctoral Fellow Roslin Institute, UK . 1990-1991 Post Doc in experimental embryology, Institute for Zootechnics, Olmedo, Sassari, Italy. 1987-1990 PhD Reproductive Physiology, Sassari University (Italy). 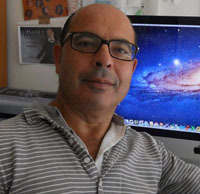 The research carried out by Prof. Pasqualino Loi focuses on Developmental Biology and particularly all aspects of Biotechnologies applicable on embryos; in vitro maturation and fertilization, in vitro embryo culture, embryo freezing, embryo biopsy and sexing by PCR, embryonic manipulation with special regard to nuclear transfer (cloning). His current area of research is nuclear reprogramming and the epigenetic modification of DNA induced on early embryos by cloning and other in vitro manipulations. He have published over 80 papers on peer reviewed journals, including excellence ones, like PNAS and Nature Biotechnology. Click here to see publications.